In an appearance before a Senate panel on Wednesday, Attorney General William Barr declared he thinks “spying did occur” during the 2016 presidential election—only it was against Donald Trump’s campaign. Barr’s concerns suggest that the Russia investigation may have been mishandled from the beginning. 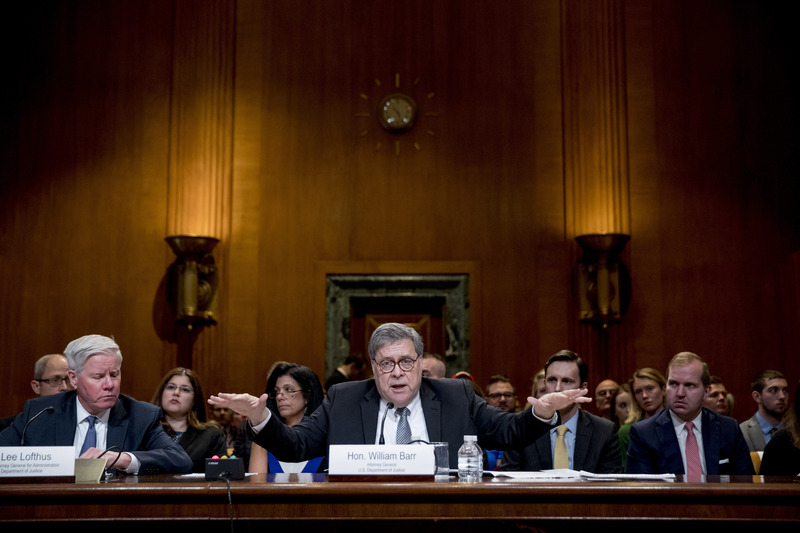 Barr's remarks boost Trump supporters who insist his 2016 campaign was unfairly targeted by the FBI. But the statements inflame Democrats already frustrated by Barr's handling of the Mueller report—especially the release of a four-page summary letter last month that they say is overly favorable to the president. The attorney general has stated that he expects to release a redacted (edited to avoid legal or security issues) version of the report next week. I think it's awesome that this guy is known for choosing his words carefully. I hope this situation gets cleared up quick! That's crazy, I don't know what else to say. Ι αγρεε, Λενα Π., Ι ηοπε τηισ γετσ ψλεαρεδ θπ φαστ! Whoops!! Sorry, I was writing in Greek!! What I meant to say was I agree, Lena P., I hope this gets cleared up fast!! I put "Ι αγρεε, Λενα Π., Ι ηοπε τηισ γετσ ψλεαρεδ θπ φαστ!" into google translate and the result was "I'm afraid, Lena P. I do not want to eat fast!" Are you sure that's right? Mmmmmm....I just got the chills! Zack, Thats what I got from google translate too! Maybe its a malfunction? Alyssa S I searched your Message in Greek and it translated into I agree Lena P.
Also how do you write in different languages??? so what!! that looked funto me!!! I didnt understand a thing!!! I really wasn't trying to pick on Alyssa S. I was just saying it's weird how all of our translating apps said different things. I didint mean to ay tha you were picking on her!! ok its a long storie...I had 3min to typ a comment and 1min to read them all so I have read the and then tryed to tpy a comment with the keys have shoing and I didnt rilly see what I was riting so I am going to translate that now and see wat i get! how do you get google to tranlate it? can somone help? Ok I got it this is what i got. . . I agree, Lena II., I. Horie tiis FET psleared fast r.t. that looks kind of weard to me?!! I did it agean and I got this. yellows, Lena P., I have done it fast! I did it agean and I got this!! I'm afraid, Lena P., I did not want to eat it! this is werad! I got this! I'm afraid, Lena P., I do not think so. this is............? I am NOT trying to pick on Alyssa S!! I just wanted to see what it would give me. This is wat you ment to write. Συμφωνώ, Λένα Π, ελπίζω ότι αυτό γίνεται ξεκαθαρίσει γρήγορα !! No offense, but we're getting a little off topic here... Alyssa S. corrected her statement by translating what she was going to say into English. I know y'all aren't trying to be mean, but after all, the article is about spying and stuff and not about Greek and Google Translate. Once again, NOT trying to offend anyone!! Sorry about the Greek, everyone!! I thought I was writing in English, but the letters are Greek, so that's why Google translate translated it strangely; also, I'm not sure if you were using the koine Greek(ancient Greek) or modern; I was using ancient Greek. sorry if it seamed that I was piking on you I did not intend to do that. pleas say so if you were offended. I think its nice that you learn Greek!